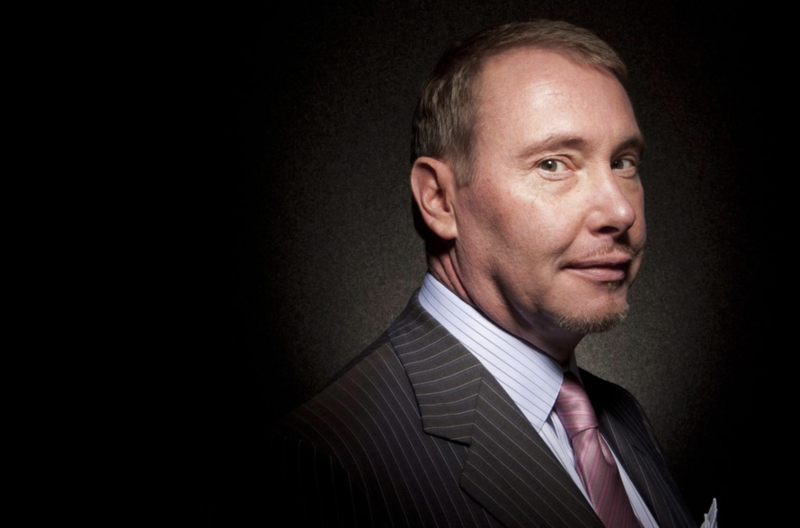 After laying out the reasoning behind his considerably more pessimistic view on the US economy during his widely watched "Just Markets" podcast, DoubleLine Capital Founder Jeffrey Gundlach - whose flagship Total Return Fund outperformed the benchmark again in 2018 - delved into some of the same themes from his year-ahead podcast this week during a round table discussion hosted by Barron's, during which the legendary bond trader warned that record levels of corporate debt - particularly in the lower-rungs of the investment-grade universe, which has swollen as companies binged on debt to buy back stock during the ZIRP years, could create problems for the equity market. But an even bigger long-term threat to markets is emanating from the supposedly "safe" market for US Treasury debt. As we've warned and Gundlach has also highlighted, the risks posed by companies that could soon become "fallen angels" is rising as the US economy is "swimming in an ocean of debt." 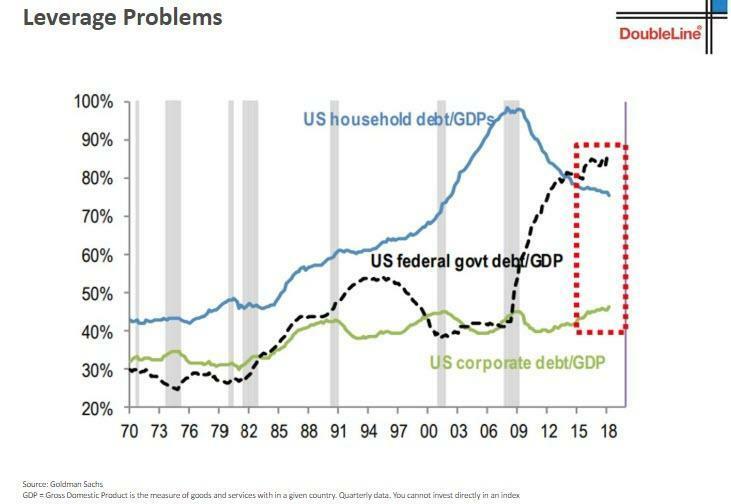 But though the risks posed by corporate debt are serious, during the round table Gundlach was more focused on the risks posed by the ever-expanding US debt - which he argued is even bigger than most Americans realize. While the US government reported a budget deficit of $800 billion during the fiscal year ended on Sept. 30, the national debt increased by some $1.3 trillion dollars. The difference, as Gundlach explained, represents the cost of national disaster relief and other expenditures that are considered one-offs. "Fiscal year for the federal government ends Sept. 30 and the official reported deficit was $800 billion dollars. The national debt increased by $1.3 trillion dollars. The differences can be things like national disaster relief and other things that are considered one off. Also there's the lending from the social security system so that's real debt too." The upshot, is the "debt has been going up a lot more than people think." And what's worse, is that, according to Gundlach's calculations, the total unfunded liabilities for welfare programs like social security amount to some $122 trillion - roughly six times annual GDP. The answer put forward by most politicians is that this is a long term problem, and that the day of reckoning can perpetually be delayed by more borrowing. But there's one problem with that. Every year, the share of the US federal budget consumed by debt service is rising. "If you put enough short terms together, you get a long term. The CDO, they project that by 2025, the interest expense could be 5% of GDP. The near-term is turning into the long term in the next few years unfortunately." Meanwhile, Gundlach reiterated his view that equities have entered a bear market, saying he expects stocks to continue to weaken before a rebound begins during the second half of the year. "So now we are in a bear market, which isn’t defined by me as stocks being down 20 percent. A bear market is determined by the way stocks are acting," he said. Gundlach also warned that, for all Trump's gloating about a strong economy, most of this growth has been artificial and fueled by unsustainable debt. "I'm not looking for a terrible economy, but an artificially strong one, due to stimulus spending," Gundlach told the panel. "We have floated incremental debt when we should be doing the opposite if the economy is so strong." In other words, Gundlach expects fiscal policies to overtake monetary policy as the primary locus of concern for investors.